If there's one thing you shouldn't give up sugar in, it's face and body scrubs! Sugar is actually a naturally gentle abrasive which helps to remove dead skin from your face, lips and body to restore and refresh tired, clogged pores. There's nothing more luxurious than scooping out a handful of a fresh, fruity body scrub, but did you know that many mainstream body scrubs can be full of nasty ingredients that might do more harm than good? Mainstream scrubs can be too harsh on the skin, containing irritating ingredients which can leave the skin dry, stripped of its natural oils, not to mention the extremely environmentally dangerous plastic microbeads which end up in our waterways and are consumed by marine life.1 If you use lotions, sunscreen and body oils, the pores on your skin can become clogged with oil build up. Regularly exfoliating your skin once or twice a week helps to speed up the skin's regeneration process, removing dead skin cells and unclogging pores to refresh, smooth and polish skin. Hormonal and dietary influences can affect your skin, causing dryness, bumps and spots on the skin's surface and a build up of sebum. Environmental conditions can also worsen the condition of your skin, with overexposure to wind and sun often causing further damage and flakiness to your face, body and lips. A natural abrasive, sugar granules can help to remove dry, flaky skin cells and brighten tired, dull looking skin to promote smooth, healthy and flawless skin. A build up of your skin's natural oils can often exacerbate skin conditions such as Keratosis Pilaris, so it's important to give your skin a helping hand to keep it unclogged and clarified by regularly exfoliating. What are the benefits of Sugar scrubs? Sugar makes an amazing abrasive ingredient in scrubs. It's a natural humectant, so it retains moisture and ensures skin is kept hydrated, making it ideal for delicate and sensitive skin, especially because it melts away upon contact with water. Sugar is also known to be a pure, natural source of Glycolic Acid, also known as an AHA, which helps to break down dead, flaky skin and help support cell turnover.2 It's extremely effective at treating mature skin while still being gentle and non-irritating on sensitive skin. Combined with nourishing oils, sugar scrubs can be used before or during bathing for a thorough exfoliating treatment that leaves skin smooth, soft and supple. You might even find that your skin care products work more effectively on exfoliated skin, as pores are unclogged and able to retain more moisture. Getting rid of dry, dead skin cells helps to reveal smoother skin which can also prolong the life of your fake tan. 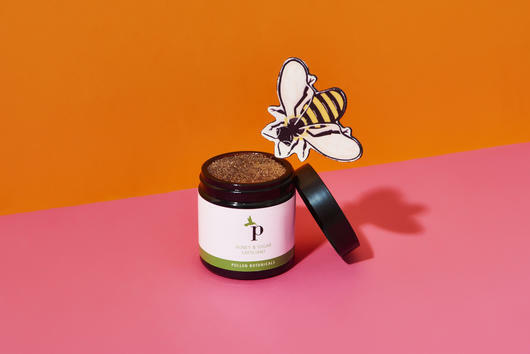 Formulated especially for skin prone to breakouts, the Pollen Botanicals Honey & Sugar Exfoliator contains Organic Sugar, Raw Honey and Molasses, known for their soothing and antibacterial properties, to break down and remove dead skin cells and unblock pores. Organic Kiwi and Papaya Extracts provide natural exfoliation from fruit acids, while Pink Grapefruit Essential Oil gives this gentle scrub a soft, uplifting scent. Used once or twice weekly, this handmade formula is also ideal for acne-prone skin. To use, partially dissolve a small amount with water, then apply to face, smoothly scrub in circular motions until completely dissolved and remove with warm water. This amazing scrub has over 150 5-star reviews! 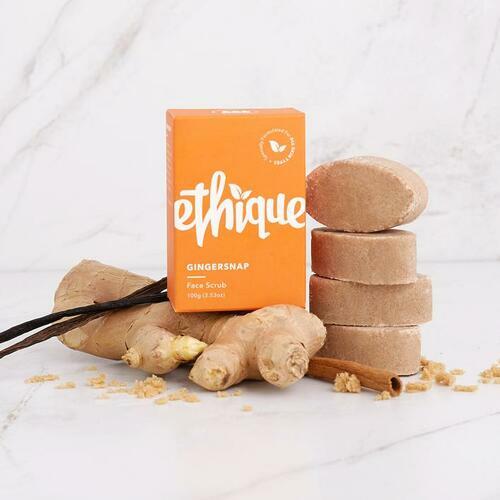 In a unique block style, the Ethique Ginger Snap Face Scrub Cubes provide gentle exfoliating action which leaves skin glowing and invigorated. With 16 solid bars, each block is formulated from a blend of nourishing Jojoba Oil, Brown Sugar and Cocoa Butter, with a delicious, mildly spicy scent from natural Ginger, Vanilla and Cinnamon Extracts. Ideal for all skin types, each block lasts for two uses. Just snap off a square like it's a piece of chocolate! This gently abrasive, vegan and gluten-free bar buffs away dead skin cells, yet leaves skin rejuvenated and lightly moisturised. To use, wet your face and a single cube with warm water then gently buff in small circles, massaging in until sugar dissolves. Rinse off with warm water. 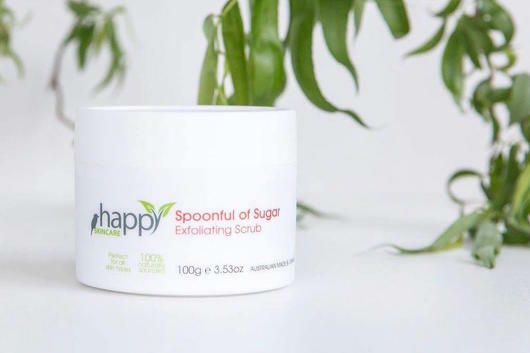 With a base of soft Brown Sugar and soothing Coconut Oil, the Happy Skincare Spoonful of Sugar Exfoliating Scrub helps to buff and polish skin while providing added moisture. This gentle yet hardworking scrub also contains super-fine grain Bamboo Powder to remove dead skin, while Shea Butter and Cucumber Seed Oil soothe and hydrate the skin. Helping to reveal a radiant skin tone and smooth texture, this vegan scrub may be suitable for all skin types and can be used on both face and body. Adjust the thickness and strength of the scrub by adding desired amount of water, and wash off with a soft cloth or a Life Basics Konjac Sponge - Bamboo Charcoal for extra power. Designed to gently exfoliate, plump and soften lips, the Buddy Scrub Lip Scrub Choc Mint also contains natural plant-based butters, oils, and waxes, including Cocoa Butter, Coconut Oil and Jojoba Oil to soothe, nourish and hydrate lips. 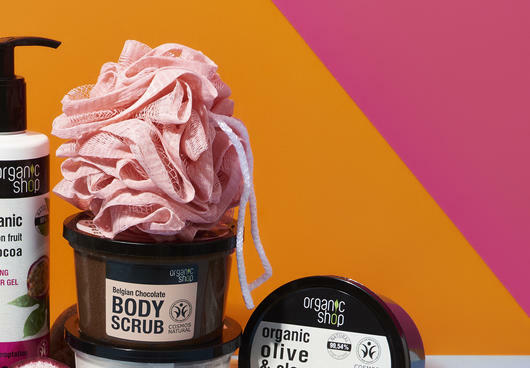 With natural Cacao Powder and Mint Flavour, this vegan, chocolatey scrub smells so good you'll want to eat it too. To use, wet lips and apply a small amount, then massage in using a circular motion, leave on for 5-10 minutes, then rinse. With antioxidant-rich Green Tea powder and Lime Oil, the Buddy Scrub Lip Scrub Matcha & Lime has a deliciously fresh Matcha and Citrus scent. With natural Coconut Oil and Jojoba Oil, this nourishing exfoliant helps to smooth and hydrate lips to provide a flawless base for lasting lip colour application. 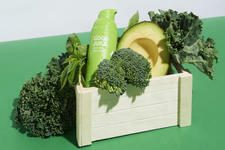 This zesty, vegan formula is Australian made and ideal for maintaining soft, plump kissable lips! 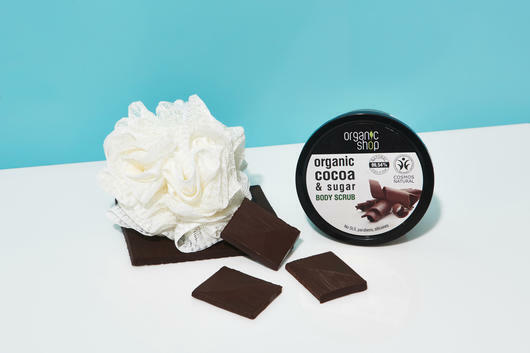 The Organic Shop Body Scrub Organic Cocoa & Sugar is a deeply energising, hydrating and deliciously fragrant body scrub. Formulated with natural Sugar, Shea Butter and Cocoa Seed Butter, this Belgian chocolate-scented scrub may leave skin moisturised, awakened and replenished, and makes a great addition to your morning shower, especially if you're a chocolate lover! With a gentle detoxifying, buffing action, this invigorating and conditioning scrub can be used on damp skin two or three times a week to moisturise and maintain suppleness. The Thankyou Coffee Body Scrub - Geranium & Rosewood is a cleansing, hydrating and exfoliating body scrub that is ideal for normal to dry skin types. With nourishing ingredients such as Macadamia Oil and Coconut Powder, this hydrating scrub removes dry skin thanks to Sugar and Coffee grounds. This vegan formula leaves skin soft, smooth and refined and can be used twice weekly to help keep skin refreshed and rejuvenated. The Organic Shop Body Scrub in Kenyan Mango is a luxuriously mango-scented sugar body scrub. With its delicious fruity aroma from Organic Mango Extract, this scrub works to nourish and exfoliate the skin, leaving it soft and silky with a healthy glow thanks to the skin softening properties of Shea Butter. This Certified Natural formula is ideal for a refreshing weekly exfoliation treatment, and has an average review of 4.8 stars! Source: 1Sydney Morning Herald, 2The Huffington Post.